Why is the car manufacturer interested in planting trees? How much pollution do cars cause? How can plants compensate for car pollution? What factors affect the capacity of a plant to absorb CO2? If you had the choice, which species of tree would you choose? Does the car manufacturer's suggested course of action really help to compensate for the pollution produced by your new car or is it only a commercial ploy? 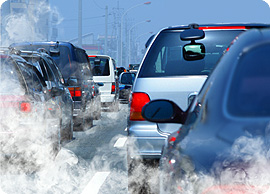 In this activity students will explore how plants can reduce CO2 pollution caused by cars. With the starting point of an advertisement of a car manufacturer, they will critically analyse the information offered on their website and produce a report based on calculations and scientific facts. Throughout the activity, students will carry out basic calculations (optionally, using Excel), determine statistical measures, explore the process of photosynthesis and factors influencing it, analyse and interpret graphs qualitatively, and optionally, estimate surfaces and volumes.